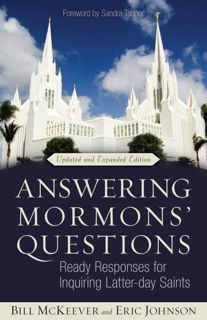 Bill McKeever and Eric Johnson will be signing their new book, “Answering Mormons’ Questions” at the Utah Lighthouse Book Store this Saturday between 1-5pm. The book store is located at 1358 West Temple (across from the Spring Mobile Ball Park). Come on out if for nothing more than to have some refreshments and chat with Bill, Eric, and Sandra! and then pointing them to Jesus . You can still buy the book. I think it would be of great help to you in learning about the doctrines of Mormonism. Is there or will there be an ebook format?